The Longhorns are Quidditch World Cup champions for the third-straight year. Texas defeated Lone Star Quidditch club 120–90 to finish off a comeback and leave Quidditch World Cup 8 victorious. The Longhorns capped off their three-peat when seeker Evan Carr caught the snitch, worth 30 points in U.S. Quidditch League play, to end the game. Lone Star Quidditch Team got off to a quick 20–0 lead, thanks in large part to chaser Christopher Scholz. The Longhorns tied the score at 20–20 when chaser Marty Bermudez was able to get past the vaunted Lone Star defense for a score. The game was back and forth, but Texas was able to take a 60–50 lead because of keeper Augustine Monroe. Monroe scored three-straight goals for the Longhorns and also played stellar defense to deny a couple of Lone Star shots. After a fierce battle, Carr came out on top with the snitch in his hand and a Texas championship in the bag. 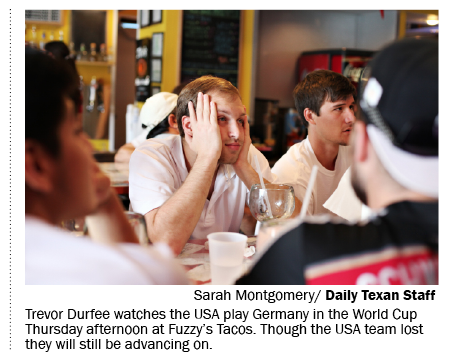 Texas finished the World Cup with a perfect 9–0 record. Germany's Bastian Schweinsteiger raises the trophy after the World Cup final soccer match between Germany and Argentina at the Maracana Stadium in Rio de Janeiro, Brazil on Sunday. It will be written in books and shared down generation lines, but nothing will ever compare to witnessing what happened on Tuesday, July 8. Brazil, the host nation and greatest international soccer team that has ever existed, lost worse than anybody could have ever thought was possible. The 7-1 dismantling by the eventual champions Germany was two hours that stopped the world and will probably never happen again. Many factors made this World Cup great but at the root of it all was the host country, Brazil. The soccer-loving culture fit perfectly, as expected. The atmosphere of games was unmatched. The scenic views of surrounding mountains and the iconic “Christ the Redeemer” statue in Rio De Janeiro topped it off. There was little doubt left of the impact a South American host can have on a World Cup. It’s where soccer is religion and where international tournaments clearly belong. Who could have predicted the superstardom of Colombia midfielder and World Cup Golden Boot winner James Rodríguez? Or the unbelievable surge Costa Rica, a nation of roughly 4.5 million, made to the quarterfinals stage? And what about the last minute victories, the improbable loses, the penalty shoot-out finishes and the consistently close games? Add the social media frenzy with each game and the dramatic story lines that followed marquee names like Luis Suárez and Neymar, and nothing was left out of this tournament. In June, we witnessed what perfect basketball could look like through the NBA champions San Antonio Spurs. And in this World Cup, we got to experience what that looked like on a soccer pitch. It shouldn’t be surprising that Germany tied the 2002 champion Brazil team for best goal differential in World Cup history, or that the team’s worst game was a 2-2 tie against Ghana in group play. Their play against Brazil put them on another level, and the way they picked apart teams with their defensive, but aggressive, style was incredible. It was soccer at its finest. Germany will be remembered as 2014 champions, but they’ll be more revered for the way they did it. Yes, a powerhouse German team did win. And all four of the semifinal teams are considered soccer greats, but down the line, other groups are emerging and ready to take the grand stage next World Cup. This tournament showed true promise of what the next World Cup could look like. Sides like Colombia, Belgium, Mexico, Costa Rica, and even the U.S., demonstrated the potential for less historic countries to make an impact. So many of these games were great because the margin of talent has come closer together between nations. This makes for a 2018 World Cup that should draw heavy attention. Because more than ever, the golden trophy could end up in the hands of first-time champions. Germany, on the verge of a penalty shootout ending with Argentina for the FIFA World Cup title Sunday, earned a victory from a strike delivered by substitute forward Mario Götze in the 113th minute of extra time, making them the first European nation ever to win a World Cup hosted in the Americas. Germany dominated throughout the tournament. They had won their group, cruised through the round of 16 and quarterfinals and dismantled Brazil to reach the final. But against Argentina, it was a struggle. There were times it appeared that the South American country would be the one hoisting the golden trophy. Moments like the 47th minute, when Lionel Messi was just feet away from the goal before he struck the ball and missed by the closest of margins. There was also forward Gonzalo Higuaín’s miss in the 22nd minute, a shot that was taken from twenty yards out in a one-on-one situation with German keeper Manuel Neuer. The goal could have given Argentina the early lead in a very defensive contest. But Germany had already proven many times this World Cup that if you let them stick around they will find a way to come out victorious. And that is exactly what happened at Estádio Maracanã in Rio De Janeiro. They had put up their previous chances too. Defender Benedikt Höwedes’ header in the 46th minute was inches away from crossing the line, but bounced off the right goalpost instead. In the 91st minute, forward André Schürrle was just outside the box when Argentinian keeper Sergio Romero deflected his right-footed strike away from goal. The scoreless draw was broken when a perfect lob pass from Schürrle in the 113th minute of extra time came down feet away from the goal line on Götze’s chest, from there he volleyed it past Romero for the latest goal in World Cup Final history. A German side that had been awaiting this moment since their last World Cup victory in 1990 rejoiced, while Argentinians, who dominated the crowd inside of the stadium, saw their hopes of victory slip away. There would be no reliving the Diego Maradona 1986 glory days. With the heroic goal, Götze became the first substitute to ever score in overtime of a World Cup final. And for Germany, the team that played as sound and organized as any soccer team ever has, the World Cup title is now their fourth, only one behind all-time leader Brazil. No Neymar and no Thiago Silva. What will this mean for a Brazilian team that is making its 10th World Cup semifinals appearance? Brazil has yet to show their best, having made it to this point without any decisive victories. But perhaps that is where they find their peace going into Tuesday’s game against Germany. They know they can do better, which should be quite frightening for the opposing team. Replacing two of the most important players will be tough, but Brazil also has history on its side. The country has not lost a competitive match at home since 1975. And as shaky as they’ve been, they’ll need every ounce of advantage that they can get. Germany plays organized and disciplined, a style of play that has frustrated Brazil all of this World Cup. With a hard defensive line, Germany beats opponents by neutralizing attacks and striking when the opportunity presents itself. Players like Thomas Müller have been creating plays for the German side all tournament long. If Brazil hopes to reach its 7th World Cup final, scoring early, just as they did against Colombia in the quarterfinals, will be vital. The last time these two powerhouses met on such a grand stage was in 2002, when Brazil beat Germany 2-0 to win the World Cup. Through superstar Lionel Messi, Argentina is as close to winning the World Cup as it’s been since the days of the great Diego Maradona. The team has looked steady and Messi has been living up to his famed name. The country has yet to lose a match this World Cup, seeming to somehow always find a way to win. On the opposing side is the 2010 World Cup runner-up Netherlands, which has appeared to be the team of destiny so far. While they too have not lost a match this tournament, they have beaten opponents in nail-biting fashion, as they did in the penalty shoot-out victory over Costa Rica. Argentina has not made a semifinal appearance since 1990, and historically, they have only beaten the Dutch once. The Netherlands have the better numbers in both shooting and scoring for this tournament, with forwards Arjen Robben and Robin Van Persie each having scored three goals so far. But they also do not have a player like Messi. Nothing will be as important for this Netherlands team as keeping the Argentinian striker at bay. Messi has the second most goals in the tournament with four, but has also constantly created scoring for teammates, which is where the true danger lies. The Dutch will need to disrupt Argentina’s world class passing attack. A more wide-open type of match can be expected from this second semifinal, and based on how both teams have played; a penalty shoot-out would not be surprising. As his 2014 World Cup journey came to a close, U.S. coach Jurgen Klinsmann had plenty to think about after the Americans 2-1 defeat at the hands of Belgium on July 1. He could begin with the positives, and there are plenty of them. His team played with an effort that is worth being proud of. They played with more grit and confidence than ever. They weren’t just the same old Americans that weren’t really feared. No, this time they had really earned some respect. They had taken down old nemesis Ghana and imposed their will on powerhouse Portugal. They had held Germany steady enough to not lose decisively and had been outplayed by Belgium, but through Tim Howard, still showed that their country could also be a home to one of the best soccer talents in the world. They had played with more toughness, wisdom and poise than ever, while making sure that after this World Cup, the clichés and jokes about American soccer were all but silenced. They had also made a nation believe. They had made a country come closer together for soccer than ever before. Maybe it was because of the social media craze that’s sweeping America or maybe it was something else, but either way, “I believe” began to feel as patriotic as the red white and blue of the flag. Klinsmann’s group did not come close to winning the World Cup. In fact, they lost in the exact same way as in 2010, a round of 16, 2-1, extra time loss. But even in losing, the American side was able to capture the attention of their fans at home. Klinsmann has begun to inspire belief in his national program, but he must also be pondering what needs to happen for his team to take the next step. A marquee striker is needed with a game that reaches further than anything Landon Donovan or Clint Dempsey ever did. The U.S. needs a feared striker that the team can find its identity in – a Suárez, or Neymar or Messi type of player. Right now, the best chances lay with 19-year-old Julian Green, whose goal minutes after making his World Cup debut against Belgium made a promising statement for the future of U.S. soccer. With four years to develop until the next World Cup, Green could be ready to lead this team and be supported by other young promising players like defenders John Brooks and DeAndre Yedlin. Defense should be the bigger focus, though. A big time goal-scorer won’t make up for the lack of defending the U.S. had throughout the entire World Cup. This is their biggest task at hand to take the next step. Strong defenders are needed desperately. In the Belgium game alone, the U.S. allowed 26 shots compared to nine given up by Belgium. If it were not for Howard’s 15 saves, they would have been completely dismantled. Great defending won’t necessarily win you a World Cup, but it can neutralize teams like Germany and Brazil in their attacking. If reaching a World Cup victory is possible for the U.S., it will have to start with learning how not to lose. It’s something that Klinsmann will need to figure out. He will ultimately have to align a group that defends well and creates better counterattacks than the U.S. had in this World Cup. Klinsmann surely knows this and he has likely already began pondering what his next group of guys will look like. Nina Frausing Pedersen’s road to Texas was a long one. As in 7,230 miles-long, the approximate distance between Auckland, New Zealand and Austin. While the sophomore defender is a native of Silkeborg, Denmark, the prospect of playing for the Longhorns came about during the 2008 FIFA Women’s U-17 World Cup in New Zealand. The Danish international dreamed of coming to America to continue her soccer career and she turned to Facebook, of all places, to make that dream a reality. After the tournament, Frausing Pedersen sent a friend request to U-17 U.S. World Cup goalkeeper, Alexa Gaul, whom she had never met and who just happened to be the goalie for the Longhorns. At that point, Frausing Pedersen was simply looking for more information on how to contact coaches and the possibility of playing collegiately. The friendship grew so strong that the two have since become roommates. After Texas head coach Chris Petrucelli made the trek to Denmark to see Frausing Pedersen play, he knew she had to come to Texas. Ultimately, in a choice between Stanford and Texas, she chose the Longhorns and Petrucelli credits Texas’ persistent recruiting in convincing her. But Petrucelli acknowledges that there are some difficulties in recruiting international players, such as not being able to see them play often or differences in academic standards. But her team was always there for her. Now in her second year, things have become easier for Frausing Pedersen. She knows her teammates better and she’s more comfortable with the language and with Austin. She‘s more confident in her ability and has earned the trust of Petrucelli, who has put her in his starting 11 every match this season. The Dane, who began playing soccer at age 4 because of her father, even scored her first goal as a Longhorn in a 2-1 victory over Iowa State. That, according to her, was her greatest accomplishment during her time in Austin. Along with providing stability to the backline, Frausing Pedersen showed her versatility last Sunday against Seattle University when Petrucelli asked the central defender to start at forward, something she had never done before. Despite the accolades, Frausing Pedersen remains grounded. She understands that the expectations for this team, and for her personally, are high. She also feels that there is more to accomplish this season. For Frausing Pedersen, who admits that she still misses her friends and family back in Denmark, life has become a little easier. And in only her second year, her future as a Longhorn looks bright. Going to a historic stadium that holds 100,000 plus and hosted the “granddaddy” college football game, numerous Super Bowls and soccer’s World Cup final, would be enough to raise a player’s anxiety level. Combine that with this being the first road trip for the freshmen Longhorns, you would think they might be on edge. But with the help of their coaches and experienced teammates, the young guns appear prepared for the challenge of this road trip to UCLA half-way across the country. Defensive coordinator Manny Diaz and the rest of the coaches will teach the players about all the history that occurred at the Rose Bowl, but he believes some of the players who have never even been on an airplane before will be focused on other concerns. He said the coaches rely a lot on the older players to help with the freshmen and sophomores who have not experienced the rigors of travelling so far for games. There are a lot of distractions that go along with preparing for trip, the hotel and practice logistics in Los Angeles and the eventual game. So far this season, both on the field and off the field, this group of talented freshman have come through. Texas has used 18 true freshmen in their first two games. The continued development of these underclassmen is the key factor to the Texas’ return to excellence. Freshman running back Malcolm Brown said he is very excited, yet nervous to walk out onto the field at the Rose Bowl. Senior Fozzy Whittaker said it’s vital that the team stays hydrated on the plane because traveling has the potential to wear players out and dehydrate them. In addition, he said a potential challenge that faces the younger players is the crowd, which is going to be loud. California native Blaine Irby is confident in the freshmen’s skills. He said despite the new-ness of this weekend’s game, their strong play will continue even with the trip all the way to California. Head coach Mack Brown said the coaches attempt to make the trip fun and exciting, rather than full of anxiety. “What you try to do instead of worry is prepare,” Brown said.